BRIGHTON, Ontario – The Canadian Furniture Show will open the doors on its 2017 edition in a week’s time and this country’s only national furniture trade event will be celebrated throughout the Summer edition of the HGO Merchandiser, which is ready for download right now. All industry trade shows everywhere are all facing a common problem: attendance – whether by participating exhibitors or attending retail buyers. But Michael Knell, HGO editor, believes if you are a Canadian furniture, mattress and major appliance retailer attending CFS should be mandatory. That’s also true if you’re a vendor looking to do sell that very same retailer. After all, the world is changing and coming together in one place to learn from each other is a pretty good place to start. 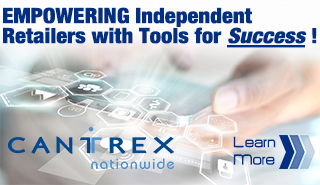 Our preview of the show – headlined ‘Celebrating the Canadian industry’ – includes an overview of the new Lunch & Learn seminar series as well as other new wrinkles being introduced to the three-day market, which is being held at the International Centre in Mississauga, Ontario. The organisers are promising all the right things to the attending retail buyer, including great product, a great shopping environment with opportunities to learn and network. Also included is a quick run-down of the industry’s social highlight of the year – the Canadian Home Furnishings Awards gala. Being feted as the Retailer of the Year (for the second time, no less) is Leon’s Furniture Limited, Canada’s largest full-line home goods retailer. Meanwhile, the Lifetime Achievement Award will be bestowed on veteran retailer Dennis Novosel, founder of Stoney Creek Furniture, the destination store just outside Hamilton. In this issue, we also take a look at the online mattress business, which has been disrupting traditional bedding retail for the past couple of years. 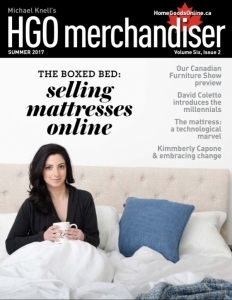 In The boxed bed: selling the mattress online, contributing editor Ashley Newport introduces four Canadian ‘pure play’ mattress e-commerce retailers, all of whom are working to carve out their own unique niche is what may be the fasted growth segment in mattress retailing today. Ashley Newport also profiles Kimmberly Capone, the president and head buyer for Treasures/Kimmberly Capone Interiors, and looks at how she dramatically transformed her fledgling family’s business model by reinventing the wheel and taking risks – something that ultimately quadrupled her company’s sales. All she did was adopt a new way of selling. Have you met the millennials? is the question answered by David Coletto, this country’s acknowledged expert on the millennials, in his first essay for Home Goods Online. He introduces us to this group of people, born in the years beginning in 1980, who are going to determine the fates and futures of furniture, mattress and major appliance retailers for literally decades to come. In our Product Strategies essay, we examine a few of the ways technology is driving growth in the mattress and bedding business. The product itself is becoming more technologically sophisticated. So is the means by which is marketed and sold to the consumer. The good news is, one doesn’t need a degree in computer science to take advantage of the latest advances. Click here to download your copy of the Summer 2017 edition of the HGO Merchandiser.